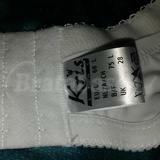 This is one of the few bras Kris Line makes in a 28 band and in a cup above a K. In fact, it’s the only one I’ve been able to find! 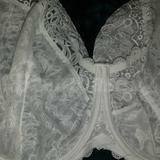 Betty is an unlined white lace bra. There are 3 parts to the cup, and the band has 3 hooks and 4 rows of eye loops. The band measures 24” and stretches to 30” making it functionally a 30 band instead of a true 28 band. The cup depth measures from a 13” (as measured hovered between the knees with the tape measure placed into the cups without any resistance) to a max of 15” stretched over the knee, while the height is 10.5” and width is 7.5” which is quite wide for a Polish brand bra. The gore is 3.5” tall and .5” wide, and the wing is 5”. 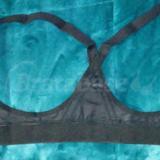 While this bra is nice and beautiful, it was too big in the band for support and too wide in the cup for comfort for me. If this one came with smaller wires, I would love it! To compare, the volume of the cups would equate to Ewa’s BM 60K-KK depending on the style, or SF and SM 60KK, but with wider wires. On Dec 2018 It fit her! On Jul 2018 It fit her! On Apr 2018 It fit her! On Jul 2017 It fit her!